Home News McIlroy Confesses He Could Play Both David & Goliath In His Latest Consciousness Read. McIlroy Confesses He Could Play Both David & Goliath In His Latest Consciousness Read. 2 months ago by Bernie McGuire Comments Off on McIlroy Confesses He Could Play Both David & Goliath In His Latest Consciousness Read. Rory McIlroy’s latest consciousness read has the four-time Major winner playing both the part of biblical legends Goliath and also David in the countdown to this year’s Masters. McIlroy has become a real bookworm having read a number of similar theme books of late and with his current choice the England-born, Canadian national and now US-based Malcolm Gladwell’s ‘David and Goliath’. Gladwell brings a modern interpretation to the ‘good over evil’ fable making the point David, quick and accurate with the slingshot was, in fact, the one who had the advantage over Goliath, who was too big and slurred-eyed to realise the tables had been turned. 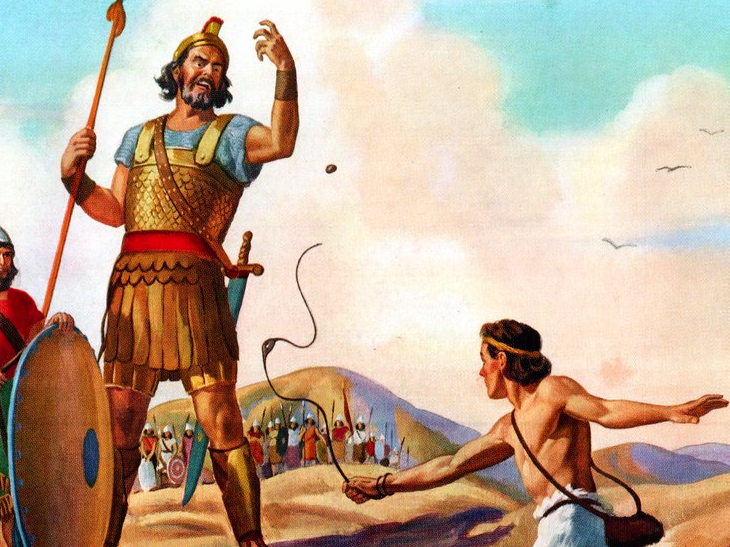 David and Goliath – the famed biblical tale of good over evil. “I can see myself being both David and Goliath,” said McIlroy ahead of this week’s Genesis Open. “I think it’s always good to have David’s mentality but there’s obviously being Goliath has its advantages, as well. “Obviously, the book is based on that story but it more about modern day interpretations of the story. “I’ve read a lot of Gladwell books actually the last few years. I have a good collection of books, so I have read a couple of good ones recently. It is where McIlroy says he has been drawing his ‘it’s more about the journey than the results’ quotes in recent months. “I have been saying it’s all about the journey and that is what it is. You look at someone like someone like Phil Mickelson who wins at 48 years of age and he is the epitome of someone that’s just stayed the course and it’s the journey. I chatted with McIlroy on Tuesday in walking the last four-holes of a practice round that ended near noon. He and Scotland’s Martin Laird teamed but losing the money to their two Genesis Open rivals. But then in walking-up the final hole, the par-4 ninth, the competitive side of McIlroy clearly again came to the fore. ‘Rors’ suggested to caddy, Harry Diamond a little side bet from a tricky-looking lie from just off the ninth green. “Okay Harry. If I can get down in two from here for ‘2’ you’e buying dinner,” said McIlroy smiling. McIlroy did just that. “Get your wallet out Diamond,” said McIlroy. Diamond mumbling under his breath commented: “I should have given him the wrong club”. McIlroy heard the comment and began laughing. “Dinner is going to taste good”, he said. Both were headed back to the hotel to catch the Manchester -v- PSG Champions League game. “I’ve then got to be back here at 4pm for a Players Advisory meeting, so it’s going to be full day,” said McIlroy.